A water transmission main replacement project on Portugal Cove Road is scheduled to start the first week of April and will continue until late fall 2018. On Monday, April 2 traffic on Portugal Cove Road may be disrupted as heavy equipment is set up between New Cove Road and Elizabeth Avenue. During the week of April 9 Portugal Cove Road will be closed between New Cove Road and Elizabeth Avenue. Residential traffic and emergency vehicles will have access with all other vehicles detoured on to New Cove Road. Sidewalk and driveway access will be maintained where possible. This project is in response to significant water main breaks along Portugal Cove Road. 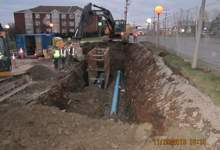 The existing water transmission main is the original 100-year-old main that connects Windsor Lake to the downtown area of the city. The scope of the work includes replacing the main and building a new underground pressure reducing station near the intersection of Portugal Cove Road and New Cove Road. Work in this section will continue for several months, then the construction will continue to the section of Portugal Cove Road between Elizabeth Avenue and First Avenue during the summer. Further information about the project including FAQ is posted at engagestjohns.ca, please see Portugal Cove Road - Water Transmission Main Replacement - Phase 2.